'Citizen Soldiers' Begin The Journey Home Members of the National Guard's 182nd Infantry Regiment recently touched down in Indiana after a long trip and a long year in Afghanistan. Over the next year, Weekend Edition will follow these men through their shift from soldiers to civilians. 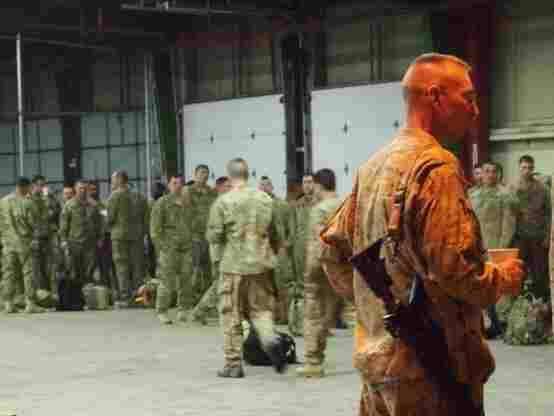 Members of the 182nd Infantry Regiment arrive in Indiana after spending a year in Afghanistan. They will spend about a week here before returning to their homes in New England. A few days ago, a plane carrying members of the 182nd Infantry Regiment touched down in Indiana. The 303 soldiers who were on board are members of an Army National Guard unit that has just finished a yearlong deployment to Afghanistan. Weekend Edition is spending a year with the men of the National Guard's 182nd Infantry Regiment as they make the transition from soldiers to civilians. The soldiers, dressed in their combat uniforms and carrying their weapons, bounded down the stairs from the plane. They shook the hands of the generals who had gathered there to welcome them home. It was the middle of the night and raining, but none of them seemed to mind. It had been a long trip and a long year. For the past decade, the National Guard has been called on to be a major part of the fighting force both in Iraq and Afghanistan. These so called "citizen soldiers" have deployed to the war zones multiple times, leaving families and careers behind. Now, as the wars draw down, many Guard soldiers are facing new challenges. They don't have the same level of resources or support networks that active duty soldiers have when making the transition back to civilian life. And their transition can be a rough one — sometimes they don't have a job to come back to, family dynamics have changed — and some end up trying to go back to the war zone as quickly as possible as a way to cope. Others don't cope at all. According to the Pentagon, the suicide rate among National Guard soldiers is higher than the active-duty force. The 182nd Infantry Regiment is based in Massachusetts and Rhode Island, but before the soldiers return home, they go to Camp Atterbury, Ind., for what's called the demobilization process. The process consists of seven to 10 days of medical screenings, behavioral health assessments and lots of briefings. Soldiers are told how to maximize their military benefits. They are given advice on how to find jobs if they don't have them, and there are conversations about how to navigate changes in their personal lives — a divorce, a death, coming home to a family that may not understand what they have just been through. Most soldiers here are counting the days, even the hours, until they can fly home and see their families — and restart their lives. Others are more reticent. The experience they have had has changed them. And while they want to go home, they are afraid to leave behind the strange sense of security — the strong bonds of camaraderie that they have developed in the war zone. Members of the 182nd "Yankee Division," as they're called, will leave Camp Atterbury and return to New England sometime next week. Their families will meet them at the airport, and that will begin the next chapter.